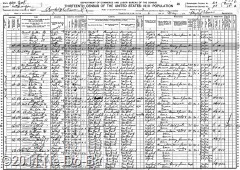 1910 U.S. Census, Randolph, Cattaraugus Co., NY, Pg.15a, dated 6-May-1910. Frederick H. Horton, head, male, white, 57, 1st marriage, married 30 years, he and both parents b. NY, English, farmer on a diary farm, can read & write, he is renting the farm. Carrie A. Horton, wife, female, white, 54, 1st marriage, married 30 years, given birth to 3 children only 2 now living, she and her mother b. English Canada, father b. Illinois, immigrated in 1860, English, can read & write. The first thing of note is the missing children. One has died since the 1900 Census. Based on the names of surviving children at the time of her death, the deceased child must be “Mary B.”. At the time of the 1900 Census, Mary would have been about 19 and she was not living with her parents. She might have been married or working away from home, but knowing she died before this census brings to mind another possibility. If she was suffering from some disability in 1900 which eventually lead to her death, she might have been at a “health” facility of some sort. TB comes to mind but there are other possibilities as well. I don’t have the time to look into this myself, but Carrie’s descendants might want to look for available records for local hospitals and asylums if there are questions about her. The other two children are now grown. Carrie & Fred are trying their hand at diary farming in Randolph. They are now in their 50s and without children to help with the chores. It makes me wonder what event might have precipitated such a move at this point in their lives. Once again Carrie and her mother are listed as being born in Canada and this time English Canada is being specified. This generally refers to Ontario. Once again I find a surprise concerning her father’s birth place. In 1900 she claimed he was born in Wisconsin and now she is claiming Illinois. This is getting interesting! Carrie states she came to the U.S. in the year 1860, which would make her about 3 years old. At such a young age, I question if her knowledge of the immigration year is accurate. It does however, give me a place to start when I turn my research towards finding the Kanistanaux family prior to their appearance in Stockton, NY.